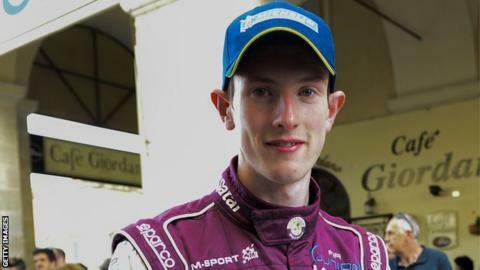 Welsh rally driver Elfyn Evans says it is "surreal" to be involved in the World Rally Championship following his 2013 breakthrough. The son of former British Rally champion Gwyndaf Evans, Elfyn, 25, lies fifth in the series led by Frenchman Sebastien Ogier after three events. The WRC's fourth leg gets underway in Portugal on Thursday. "It's a familiar rally, but still daunting and still early in the year," said Evans. "I hope that we can be consistently closer rather than just once in a while." Evans and co-driver Daniel Barritt, 33, finished fifth in the 2014 opener in Monte Carlo and fourth in the last round in Mexico, but did not complete the second round in Sweden. He added: "I was sat here a year ago going to face an event in a regional rally car for the first time and thinking 'what will the car be like, what will the stages be like?' and it was completely unknown for me. "And to be back here 12 months later having done three events already in a world rally car is a bit of a surreal feeling, to be honest." However, Evans says the familiarity of Portugal is a help on what he expects to be a technical, but fast event despite the disruption heavy rain has brought to some of the stage venues. And he hopes to continue progressing in the sport by ensuring his car finishes each rally while increasing its speed.